Habit: Annual 2--11 cm; taproot slender. Stem: spreading to ascending, leafy. Leaf: basal and cauline, 1--3 cm, basal generally withering in fruit. Inflorescence: axillary, raceme or panicle, open to dense, 1--3.5 cm; bracts ovate to elliptic; pedicel stout, <= 1 mm, generally appearing jointed at base; flowers persistent in fruit to not. Flower: sepals 2--4.5 mm, generally unequal (outer >, wider than inner), round, ovate, or reniform, generally scarious on margin or becoming scarious throughout; petals 4, 1.5--3 mm, generally white; stamens (1)3; style 0.5--1 mm, stigma +- sessile. Fruit: 3--6 mm, ovate to oblong, deciduous or not. Seed: 5--20, 0.5--0.7(0.8) mm, papillae marginal or throughout. Chromosomes: 2n=44. Note: Unnamed variety in Baja California. Flower: sepals ovate to reniform, margin often scarious. Fruit: generally not deciduous. Seed: 0.6--0.7 mm, papillate throughout. 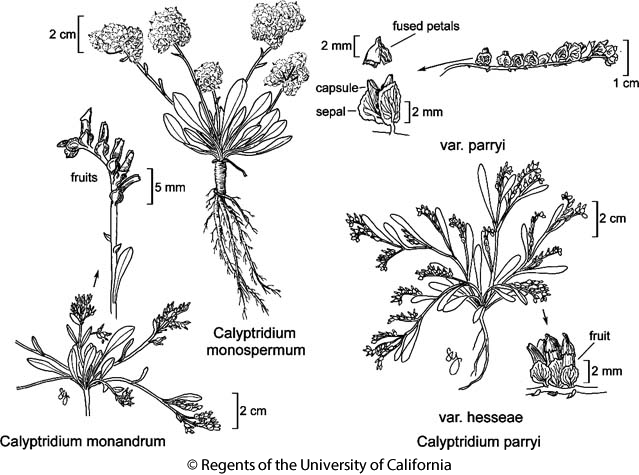 Citation for this treatment: C. Matt Guilliams & John M. Miller 2014, Calyptridium parryi var. parryi, in Jepson Flora Project (eds.) Jepson eFlora, Revision 2, http://ucjeps.berkeley.edu/eflora/eflora_display.php?tid=75401, accessed on April 19, 2019.
s SCoRO, TR, SnJt. Markers link to CCH specimen records. Yellow markers indicate records that may provide evidence for eFlora range revision or may have georeferencing or identification issues. Purple markers indicate specimens collected from a garden, greenhouse, or other non-wild location.